Old school kosher dills are one of my favorite go-to snacks. They’re fresh tasting and crunchy and salty. I almost always have a big jar in the door of the fridge. This dead simple recipe was adapted from Mark Bittman’s How to Cook Everything. Having made these countless times (almost every 2 weeks for the last 4 years which I guess puts me close to consuming about 200 pounds of these,) I’ve got this recipe and technique fairly down-pat. And once you do, you can make all sorts of interesting adaptations. I think these are as good as any deli pickle I’ve had, and dead simple to make. There aren’t a lot of ingredients to this recipe, so choose wisely. Not all cucumbers are the same. For these, and most pickles, you need pickling or kirby cucumbers. They usually look like stubby, bumby little cucumbers. Slicing or english cucumbers just won’t cut it in this recipe. 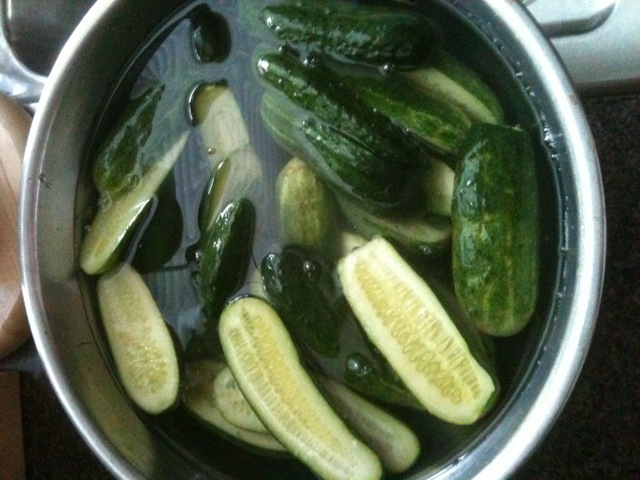 The pickling cukes stay firm and crisp once brined, the others just turn mushy. I opt for small ones, about 3 inches in length. (If you can find really really small ones forgo this recipe and make cornichons instead.) My local farmers markets have these most of the summer, and my local Whole Foods usually has them year-round, as well. This recipe calls for 2 pounds, but I never bother weighing. I just picture how many are going to fit in the jar I’m going to use. As for the salt, I use Morton’s Kosher because that’s what most of the stores around me carry. I learned that not all salts are the same after reading Thomas Keller’s Ad Hoc at Home. If you’re using Diamond Crystal or some other brand, make the appropriate substitution. Bittman’s recipe called for more salt than I use, but I found the end results far too salty. Through trial and error, I arrived at the basic formula below. Besides cucumbers, salt, and water, this basic recipe calls for dill and garlic as traditional flavorings, but there’s no reason not to experiment. Try some other fresh herbs like tarragon or parsley or chives for a different herbal profile. Throw in some peppercorns or red pepper flakes for some heat, or my favorite variation, jalapenos. 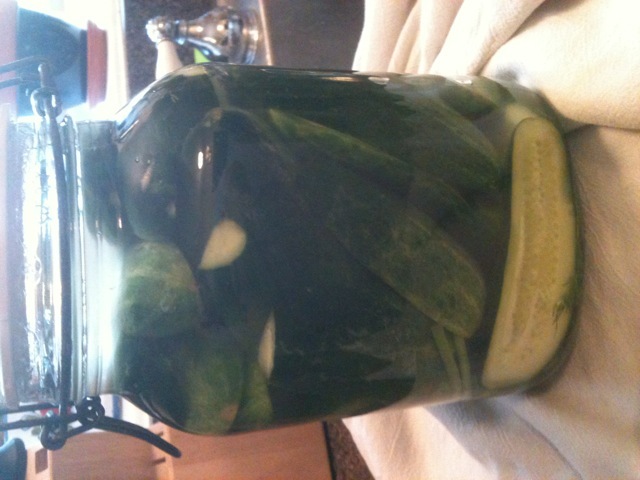 You could add some white vinegar for a little extra sourness, though these tend to sour as they ferment, anyways. Go crazy. It’ll take a couple of days for these to reach the right level of pickle-ness, but start trying after a day. They’ll stay good for several weeks. After a month or so, they get a little mushy, but actually the texture isn’t that dissimilar from what you might buy in a jar. But, if you’re like me, these won’t stick around for that long anyways.